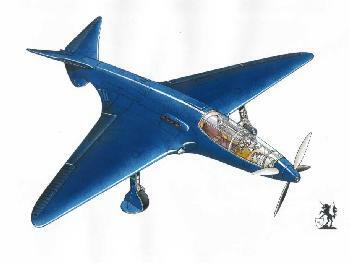 Subject of this association is the Bugatti 100P, in 1937 the development of this extremely advanced airplane was started. 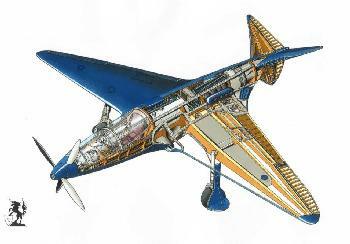 This was under contract of the French airforce ministry, Ettore Bugatti had hired the Belgian Louis de Monge as chief engineer. The first version of the airplane was planned as a speedrecord airplane, a military version would follow later. Ettore Bugatti is of course well-known through his race- en sportscars from the years in between both worldwars, but he was also interested in many other technical devices. During the first world war airplane- engines were designed and built, while in the thirties the Bugatti "autorail" was the factor that brought work to the Bugatti factory in Molsheim. This light train reached 195 km/h, and with this held the world record for a long time. Louis de Monge built his first airplanes before WWI, during WWI he designed and produced modern propellers, sold under the name Lumière. After WWI several, often technically advanced, designs were made, of which none was a commercial success. Tragically the Bugatti 100P airplane never flew, the Germans invaded Paris before it was 100% ready. The airplane surprisingly survived the war, and still exists. The airplane is now in the EAA museum in Oshkosh, USA. Both engines exist, and were built into Bugatti race-cars. Extremely streamlined design, made possible by placing the two engines behind the cockpit. A sandwich-construction in wood, where balsa wood between two layers of hard wood makes a very light, very strong ans stiff construction. Propulsion by two counter-rotating propellers, driven from the two engines by axles under the pilot´s elbow. The engines were special developments of racecar engines, 8 cylinder 4.9 litre with compressor and many magnesium parts, approx. 450hp. Automatic wing-flaps, that changed the wingprofile for extra lift or less drag. Adjustment automatic according to airspeed, throttle etc. This system was also capable of acting as an airbrake, or be used during dives. The same system also automatically lowered and raised the retractable landing gear. Special cooling system with radiators in the fuselage, air entering at the leading edge of the stabilisers. The air flowed through the fuselage to the front, exiting at the trailing edge of the wing.